Our diverse pest control service delivers first-class results right across the spectrum. 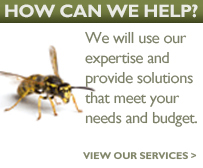 We offer individual attention to each client ensuring that we understand their specific pest control needs, offering accurate pest control advice to help meet their Health and Safety obligations whilst protecting the environment. Northumbria Pest Control are the north east's experts on the eradication and control of bedbugs. You can read more about our bed bug treament service here. A survey to all internal and external areas to establish the extent of any rodent infestation. Identify and points of entry and advise in environmental conditions that may be causing the infestation. A survey to all internal and external areas, correct identification of the insect and its life-cycle as this is important to the success of the treatment and eradication of the insect pest. A written report at the end of every treatment, advice and information to prevent re-infestation. A survey to determine the type of pest bird and advise on the most humane cost effective and up-to-date method for the removal of the bird problem from your premises. A full range of Electric Fly Killing Units suitable for any location are available for sale or hire. If you have any questions regarding any aspect of our service, please do not hesitate to contact Northumbria Pest Control.